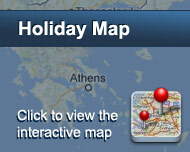 Hotel Matina is a traditionally built lodging in Kamari village of Santorini. It is situated in a serene surrounding amidst gardens and flowers, a few minutes walk from Kamari beach, famous for its crystal clear waters and long sandy beach. The architecture follows the traditional style of Cyclades islands, with white and blue colourings prevailing at its exterior and interior decoration. The hotel was fully renovated in 2005 and is now consisted of 27 fully equipped rooms, 2 Suites and 2 apartments with kitchenette. The rooms are spacious with wooden furniture and bright colours. They are all equipped with A/C, direct dial telephone, satellite TV, safe deposit boxes, refrigerator, music, radio and hairdryer. The apartments additionally have a fully equipped kitchenette. 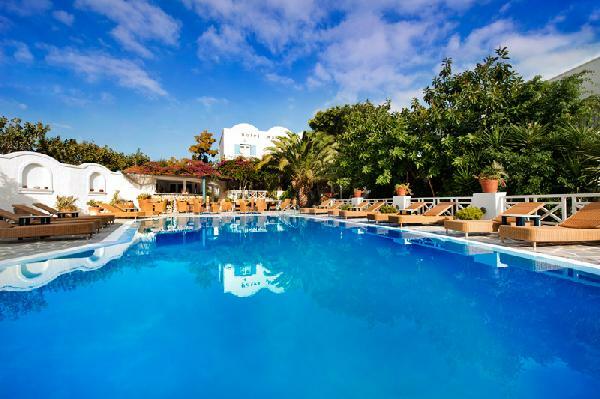 The hotel features a large swimming pool and a pool bar where all visitors can enjoy their swim, the sun or a cool drink. The experienced personel will provide you any information needed concerning your stay at the hotel and all tourist services with the help of our travel agency situated next to the hotel, ILIOVIMATA TRAVEL. Special Seasonal Offers & Internet Discounts: We offer special discount for bookings made via the Internet depending on the season & availability. Είστε ιδιοκτήτης ή διευθυντής στο MATINA HOTEL; Εγγραφείτε τώρα για δωρεάν εργαλεία, που μπορείτε να χρησιμοποιήσετε για να βελτιώσετε την καταχώρησή σας και να συνδέσετε την ιστοσελίδα σας και το σύστημα κρατήσεών σας.